Our extensive selection of arbor gates and extensions includes classic garden gate designs and privacy gates. In addition, other styles of arbors with gates include: Mission style gates, Asian style gates, moon gates and double gates. Any of these gate and extension styles can be used with any of our arbors. The arbor section of this website contains the full line of arbors available. 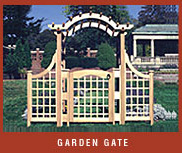 Trellis Structures cedar arbors with gates are carefully crafted and distinctively designed for a lifetime of enjoyment. My wife and I have received numerous accolades about our new arbor and I have been taking the credit that you and your crew rightly deserve. Your attention to detail, your crew's accuracy in manufacturing the pieces, pre-fitting and pre-drilling the components and marking all ahead of time made the assembly and installation a breeze. This kind of high level of service and enthusiasm is all too uncommon in many industries. All of our wooden garden gates are interchangeable with any of our arbor styles. Create an elegant entryway with a beautifully crafted privacy gate or a custom gate for your home.